Maharashtrian Bridal Naths that are giving us major #BrideGoals! A bridal nath or nose ring is an integral part of every bride’s wedding ensemble. In Maharashtrian weddings, wearing a bridal nose ring or a Marathi nath signifies the beginning of a woman being married. While there are hundreds of nath designs that Maharashtrian brides can choose from, the traditional style is perfect; especially if you are planning to wear a Paithani saree on your wedding. Within the traditional Marathi nose ring too, there are various styles which you can choose to match the rest of your jewellery. I have picked some gorgeous Maharashtrian nath styles that real brides wore on their wedding day. Go on, pin these beautiful nath designs to your Pinterest board and use them as an inspiration for your wedding look. Studded with pearls and rubies in a half-moon shape, this Karwari Nath will be the showstopper of your traditional Maharashtrian look. One of the most popular piece in traditional Maharashtrian jewellery, this Brahmani Nath looks super cute on all face shapes, and goes well with all kinds of bridal Maharashtrian sarees. It looks especially great if you pair it with moti jewellery like chichpeti haar and moti bangles. Brahmani nath, sans the pearls. If you are not a huge fan of pearls, you can modify this classic piece and turn it into an all gold nath. Looks equally stunning, isn’t it? Nope, the basic shape of Maharashtrian nath doesn't change. But did you notice how this beautiful bride has customised it to her preference by making it smaller in size, taking off the pearls but still keeping the centre Ruby intact. Oh, there’s also a small diamond in there. A great way to suit this classic nath to your style, right? 5. There’s no love like gold love! Just loving how this beautiful bride has chosen to wear all gold jewellery. The traditional thushi along with Laxmi haar and golden nath complete her look. 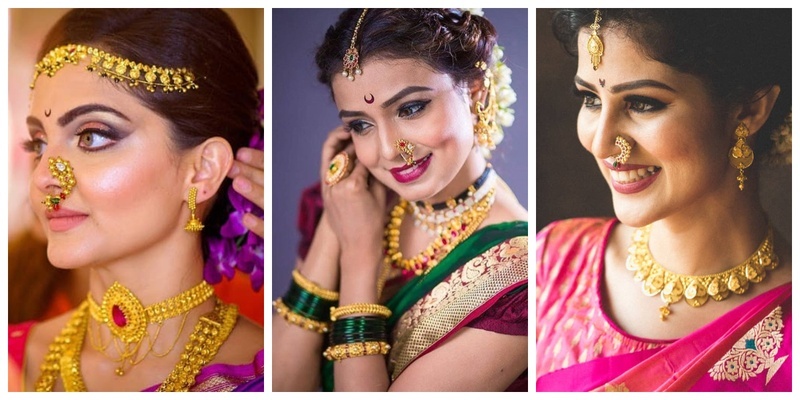 It’s amazing to see brides taking cues from traditional Maharashtrian jewellery and changing it to their needs, right? This bride right here has chosen an all-yellow look too. Doesn’t that gold nath look fabulous with her entire ensemble? A regal spin to the Brahmani nath, this bride carries off a heavy moti nath along with the traditional Kolhapuri saaj with such grace that she’s giving all of us some major #bridegoals. Can queen Priyanka be left behind when we are talking about gorgeous Maharashtrian brides and their beautiful choice of naths? The way Priyanka has slayed as Kashi Bai in Bajirao Mastani is something I will never get over. Her traditional Maharashtrian jewellery along with the kickass moti nath makes her look every bit of the Peshwin Bai she plays in the movie. Is there any one nath design you loved the most? Or all of them just too pretty to choose?